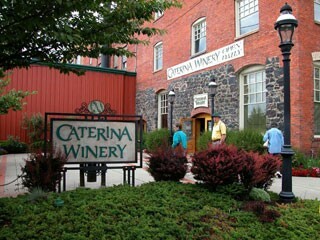 Caterina Winery first opened in 1993. In the ’90s, the winery and its winemaker, Mike Scott, played a key role in creating a vibrant wine culture in Spokane. Now it’s back in full swing under a new owner and winemaker, Don Townshend. Last Thursday night marked the grand reopening of the winery (which is on the lower floor of the Broadview Dairy, just north of the river on Washington Street). When it came time to move out of the garage and produce his first commercial run, Townsend turned again to his friend Mike Scott. That first Townshend vintage went into bottles at Caterina. Jen Westra, the manager at Caterina, describes the collaboration as typical. Scott and Townshend are “eager to help others learn,” she says — which has paid off in the revitalization of Caterina. You can try them for yourself immediately. The tasting room in the Broadview Dairy building is open Wednesdays to Sundays from noon to 6 pm, and Caterina has its first four new wines already on the shelves: an ’08 Chardonnay ($12), an ’08 Viognier ($15), an ’07 Merlot ($18), and an ’07 Cabernet Sauvignon ($20). During the remodeling of the Caterina space, they also discovered an ’01 Merlot and an ’01 Cabernet from original winemaker Mike Scott. Limited quantities of both are also for sale.